I’ve been meaning to draw our house here for some time and today’s prompt (‘something architectural’) was the perfect opportunity. 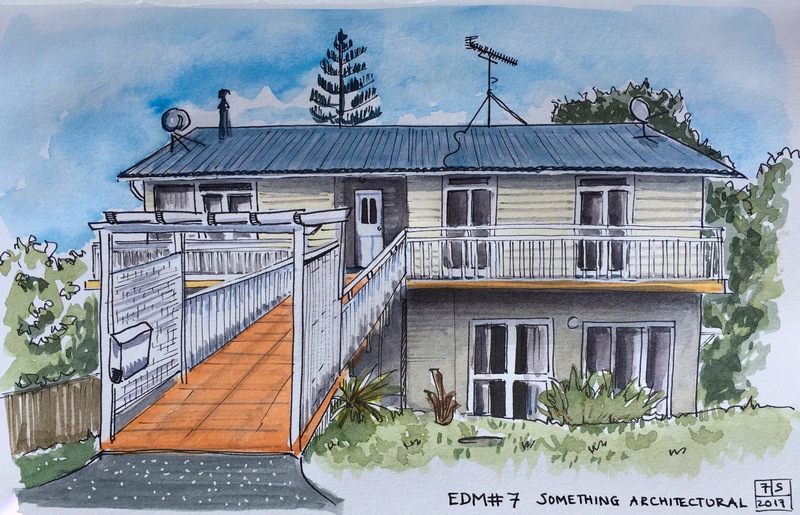 This is a weatherboard and tin-roof house, with no central heating and no double glazing – these Kiwis are made of strong stuff. It’s starting to get chilly in the mornings now and I’m quite looking forward to returning to an insulated life when we move back to the UK! Very pretty sketch. Do people in new zealand only use a fire place for heat in winters? Most modern houses have heating built in but many older ones don’t. We’ve got some portable heaters to make it warmer in the winter! I keep on being impressed!!! Fond memories of a wonderful two weeks! Well captured. Love the details and colors! You just are NOT allowed to criticise any aspect of New Zealand~! We have the best rugby players in the world and are world-leaders/beaters in everything! Of course there’s heating … sheesh … it’s just that our houses aren’t built for imported wimps. Pingback: Our house (EDM Day 7) — Tabitha’s sketchbook — С любовью к людям! Pingback: Our house (EDM Day 7) — Tabitha’s sketchbook — До каждого с миром!